The high-brightness, rapidly pulsed, multicolor light-emitting diode (LED) driver delivers lighting performance that exceeds that of conventional (laser/arc-light) sources for scientific, industrial, or commercial uses at a fraction of the cost. 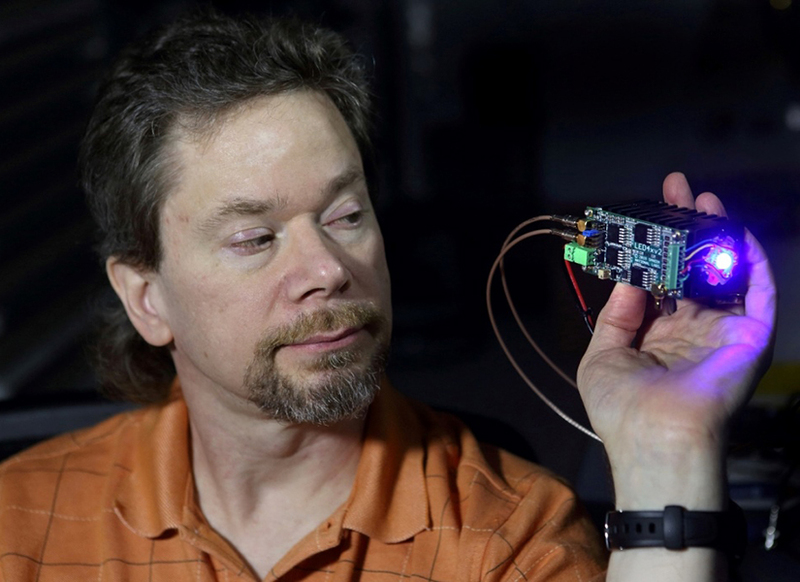 “I had the idea a few years ago to see if high-powered multicolored LEDs could be pulsed rapidly by an electronic circuit to produce very short light pulses similar to that of a 10-nanosecond pulsed laser or even down to one nanosecond depending on the LED,” said Combustion Research Facility’s (CRF’s) Chris Carlen, an electronics engineer in Sandia’s Engine Combustion Dept. The LED Pulser can be used in a variety of technical applications that normally demand far more expensive light sources and optics. Sandia engineers have already used it in several research studies aimed at developing the science base needed to design and optimize cleaner, more efficient engines that could, in turn, improve local air quality and public health and reduce the impacts of climate change. In one of these studies, a high-speed backlit spray microscopy application, the LED Pulser delivered 50-nanosecond pulses at 200 kilohertz that “froze” the motion of liquid droplets. This allowed researchers to capture high-resolution images of atomization in a high-pressure Diesel fuel-spray. Spray atomization and mixing profoundly affects combustion in spark-ignition and Diesel engines, leading to greater fuel efficiency and reduced engine emissions. Using custom electronic circuitry, the LED Pulser drives high-power LEDs to generate light pulses with shorter duration, higher repetition frequency, and higher intensity than is possible with commercial off-the-shelf LED drivers. The device’s ability to combine high intensity and short pulse duration is critical, as decreasing the pulse duration while simply maintaining the same intensity as a continuously powered LED would reduce the light energy delivered per pulse. Carlen is focusing on solving several technical challenges needed to improve the LED Pulser. “Some things can still be done to try to make it better,” he said. “When dealing with extremely high currents in very short times, rather exotic techniques must be used.” Because the LED Pulser is designed to deliver as much power as possible, the circuits can drive the LEDs to the brink of destruction. To make a commercial version of the device, Carlen realizes he must improve the design to achieve low failure rates even at high power or reduce the delivered power to a level that yields an acceptable failure rate.